So While I was browsing this post on Jody’s blog a while back I saw her use these cool images from Starving Artistamps designed by Kristin Soboloski. I had to get some. She did a knock out job. My take with these stamps I feel is less “nature” and earthy, but more whimsical? I had to ask myself if I was doing the natural images justice. But then I reminded myself that stamping is its own form of art , and while we all may use the same images, the beauty in it is seeing each persons “vision” using the same images in very different ways. That is the true art of being a stamper, and always stay true to your own style! I think I turned these nature images into what I saw in them. I have to say the solid flower and hummingbird from the set I got (Artful Inkables blossoms and petals 1) is my FAVORITE. 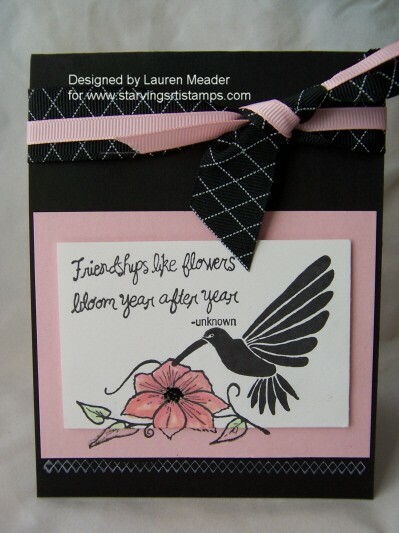 For this card I literally just cut/layered my stamped white layer onto white cardstock. I wanted the stamps to be the focal point yet really pop! No need to fuss with ribbon, eyelets, brads or whatever else. SIMPLE! I used my Twinkling H2O’s to paint on the stamps directly (they are unmounted rubber with ez mount) then stamp onto cardstock. I feel not only does this image sparkle but looks so realistically watercolored. My husbands grandmother LOVES humming birds! I am sending this to her. 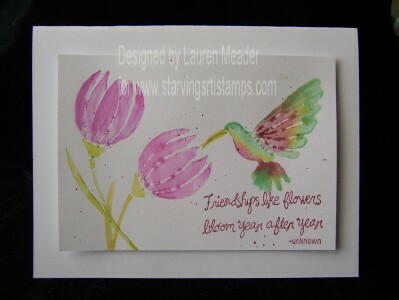 I have never found a hummingbird stamp that I like until now. I really wish the shimmer was picked up in the photo. I just loved how only the image on white has a POP of color which is just the part of the flower image. Not too much to tell just, think of this as lazymans spotlighting! LOL! I really wanted ONE image of color. I love this card. Great prices and depending on your budget something for everyone! I colored on Nicole Heady’s white cardstock sold here www.papertreyink.com. Its really fabulous too. Absorbs color amazingly well. Per Kim @ MFT stamps I got the first 2 sets of Copic Markers A & B! OMG! Can you say LOVE THEM! They are everything they are claimed to be and more. Now to scrounge up the other $ to get the next 2 sets! Coloring was SO easy! Does my flower not look gorgeous? ESPECIALLY since it was my very first image colored with those beauties. I also have to say that yes I know as far as nature and highlighting the “appropriate areas” I need practice. Im not all “naturey” so I dont know what areas should be darker/lighter I just wing it! LOL! I will attempt to practice more. But all logistics aside I think I did pretty good. Just dont send Sweet Miss Daisy here to see my shadowing! LOL! 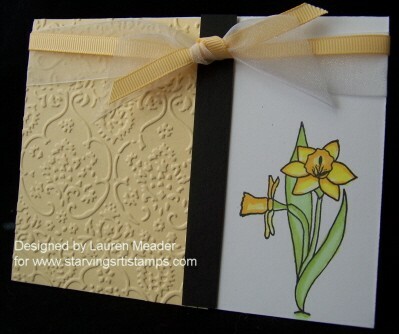 OK back to the card-=Love Daisy’s cause they are the flower used for the Cancer Awareness drive in May. Another whimsical design. Single layer. Watercolored using my Twinkling H2O’s. The lily-pad flower was on dimensionals. 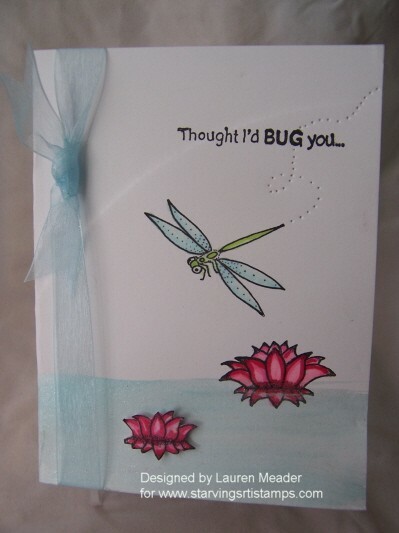 The dragonfly is from Artful Inkable bugs 1. Flowers are from Artful Inkables plants 1. I think they are the flowers you see on lily-pads. Wanted to keep this simple but pretty! 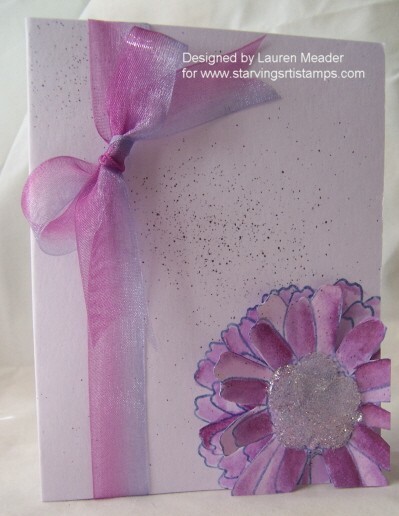 I stamped the flower in purple versamagic ink, and cut and layered. Colored with my twinkling H2O’s. Added microbeads to the large sunflower style center.